The purpose of this article is to serve as a general strategy guide with tips and advice that you should follow when attempting to win a single patty burger challenge. There are many different varieties of single patty burger challenges all around the world, and they come in all shapes and sizes. Some burger patties are thinner but have a larger diameter, and others are thicker but have a smaller diameter. Some challenges involve a very large bun and others just use a smaller one. Cheese, bacon, fried eggs, and vegetables are typical toppings, but those are usually decided upon by the bar or restaurant hosting the challenge. Some burgers may have more toppings than others of course, and you may find a challenge every now and then with no topping requirements at all! The sides included with the challenge also vary, just like with all other types of challenges. 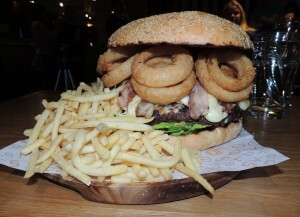 One burger challenge may use a two pound patty and another may use a four or even five pound patty. Even though there are many different variations you might encounter, the basic strategy you need to have remains similar for every variation. Before we go into the specific strategy details for winning a single patty burger challenge, please make sure you have read and understand our Basic Strategy For Winning A Food Challenge article. It’s full of 14 different general tips that won’t be included in this article, which you need to understand before attempting a single patty burger challenge. You may also want to check out our How To Win A Multi Patty Burger Challenge article and video too since there will be similarities of course. Please start off by watching our very informative How To Win A Single Patty Burger Challenge video so that you can visually see all of our different tips put into practice during an actual single patty burger challenge. For this video, I attempted The 5 lb Champion Burger Challenge at Clancy’s Irish Pub in Clinton Township, Michigan near Detroit. During this challenge, I had to finish a 2.5 lb burger patty topped with five fried eggs, cheese, bacon, vegetables, sauces, and more with one pound of fries in less than 45 minutes. Winners get the meal free and a t-shirt along with a photo on the Wall Of Fame! !